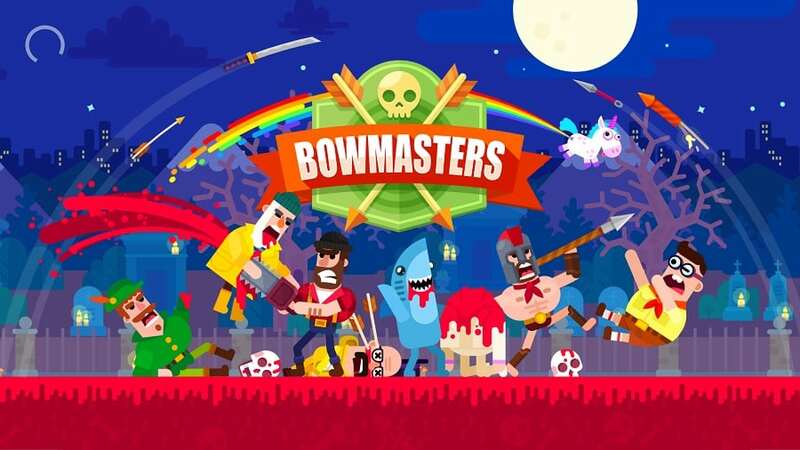 The premise in Bowmasters for PC is simple; all you have to do is hurl things at your enemies then smile in wicked glee as their guts and gore splatter all over the place. 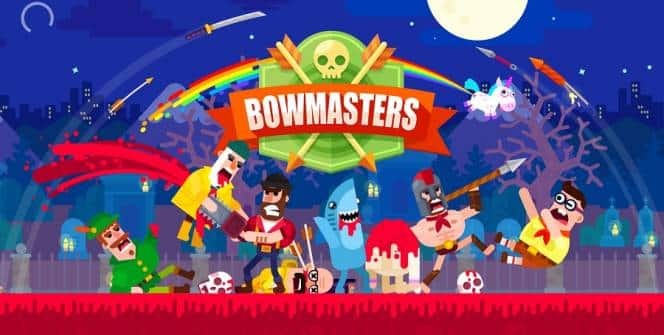 Bowmasters for PC is an incredibly simply game so it might not hold your attention for too long but you’ll still enjoy it for a bit. Bowmasters for PC starts out with a single-player story mode which has you playing against bots. When the game starts you’re placed in a large arena with your enemy on the opposite side then you take turns throwing just about anything at each other. You’ll throw random items like flags, controllers and javelins until one of you runs out of health. You control the strength and direction of the throw by pulling your finger back on the screen, and maybe to the side a little bit to adjust the angle. The first few tries will be based on guesswork but you’ll get the hang of it after a few tosses and be getting head-shots every time. Opponents generally take a few hits before you knock them out, getting more and more bloody as the game goes on. The graphics are cartoon-style so queasy feelings won’t make you any less satisfied by how many enemies you leave in a bloody mess. The characters vary as well so you won’t get bored of killing the same opponent over and over again. New game modes are available to be unlocked as you play more of the game. You can only play against bots at first but after a while you will be able to challenge friends or sign up for tournaments that give you the chance to win a larger purse. You can also opt to shoot down birds if you get bored of killing people and apple shooting lets you shoot items off a person’s head instead of shooting their head directly. 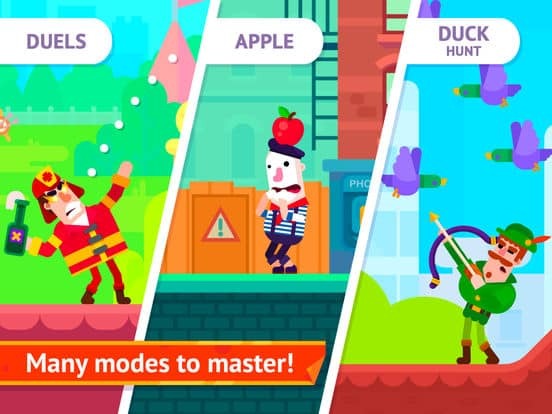 Despite the fun play-modes, what will really keep you playing is the hunt for coins. These coins allow you to get new characters, customize the ones that you already have and give you new items to hurl. Different characters are better suited to certain tasks. For example, you’ll want to use a javelin thrower to get that apple off of someone’s head rather than someone who throws something clunky. You can also choose your characters based on their special attacks which are activated by tapping the screen while the projectile is en route. With so many characters to unlock you may find yourself playing for a long time. The process is fun and helps you unwind in a simple fashion. In a gaming world where everything is trying to be complex, a simple game like Bowmasters for PC is a treat. Free-to-play means that you’re going to get a lot of ads and prompts for in-app purchases. Resist the temptation. Bowmasters for PC tries very hard to be fresh but the more you play through the more you realise that it has nothing new to offer. Despite that you’ll still enjoy the play-throughs and the light-hearted animations. Winning each bout is incredibly satisfying thanks to the bloody animation. Sometimes when playing Bowmasters, bluestacks ask you fee to pay but gives you option to download some apps. Every time it asks you just select “Install apps” and continue using it free. I hope you enjoyed this article, please rate and share. If you have problems running Bowmasters on your desktop or any other issues, leave a comment below.